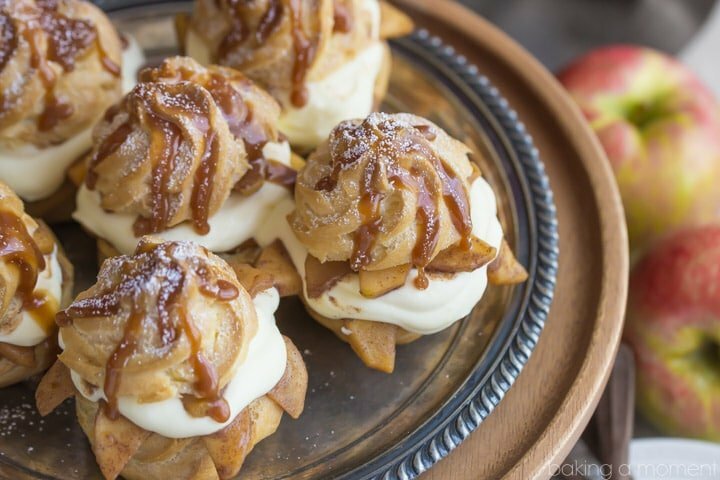 Caramel Apple Cream Puffs: Crusty, eggy choux puffs filled with juicy apples and fluffy pastry cream, drizzled with salted caramel. A perfect fall dessert! When was the last time you had a cream puff? If you’re anything like me, I’m betting it’s been way too long. Why is it that cookies, bars, ice creams, and cakes are so go-to for us? But we rarely bake cream puffs? I say let’s turn this around. 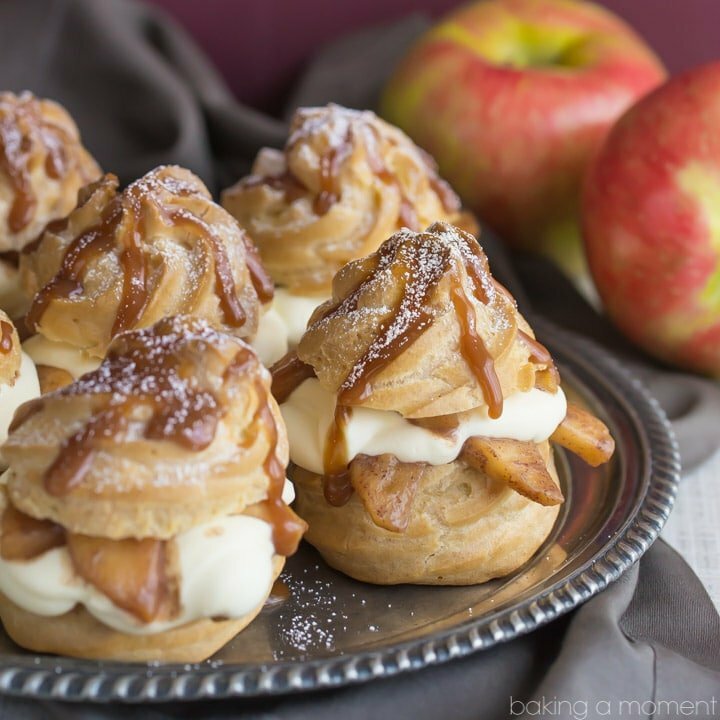 Caramel apple cream puffs are a fabulous treat, a great make-ahead dessert, and a really fun way to celebrate fall! 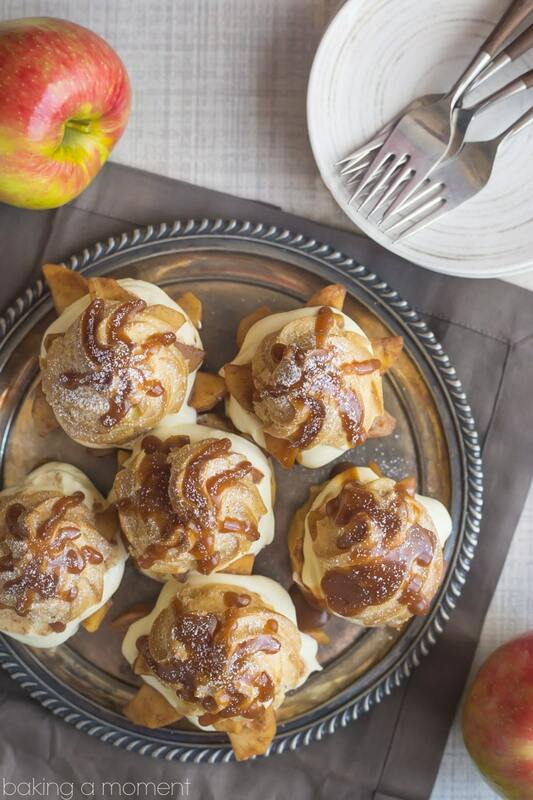 These caramel apple cream puffs were inspired by my recent trip to Washington. There, I had the opportunity to tour the orchards of one of our country’s largest apple growers. I had such a fun time on this trip! 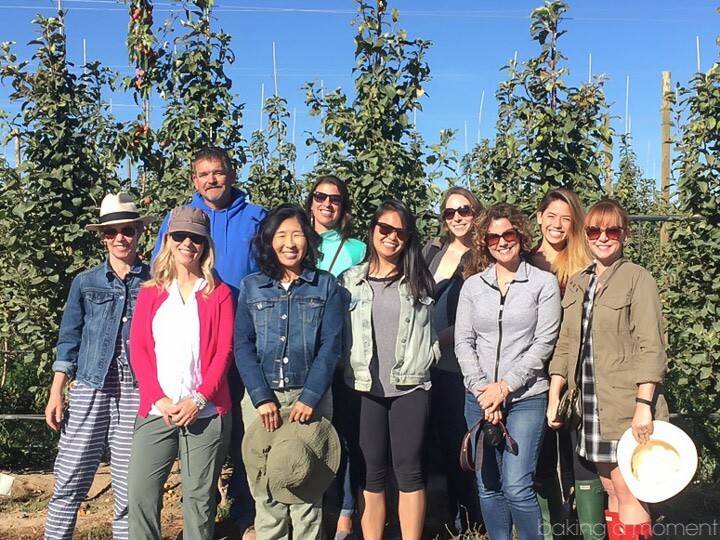 The weather was so pretty, it was such a great group of ladies, and what could be better than apple picking in September?? Our tour of Stemilt World Famous Fruit began in the pear orchard. So, so pretty and charming. 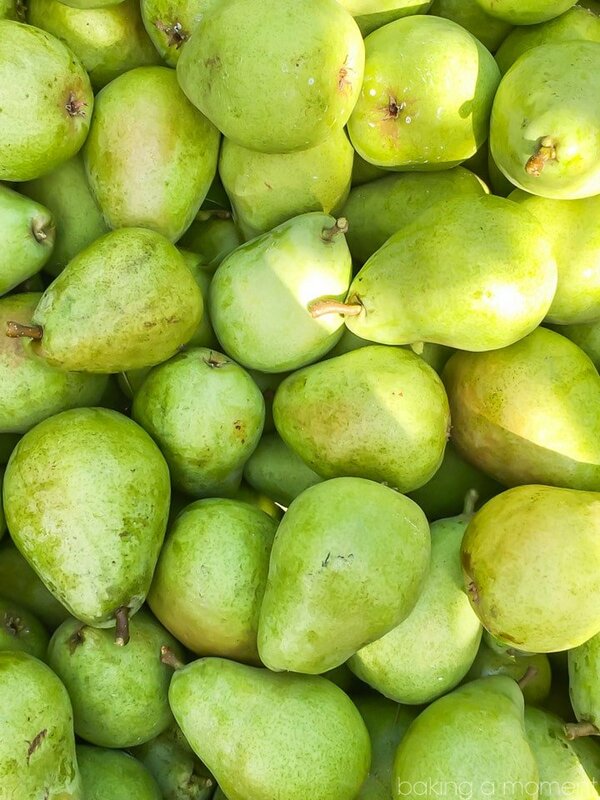 We were surrounded by trees, and the most adorable pups who were plump and round from eating pears all day. 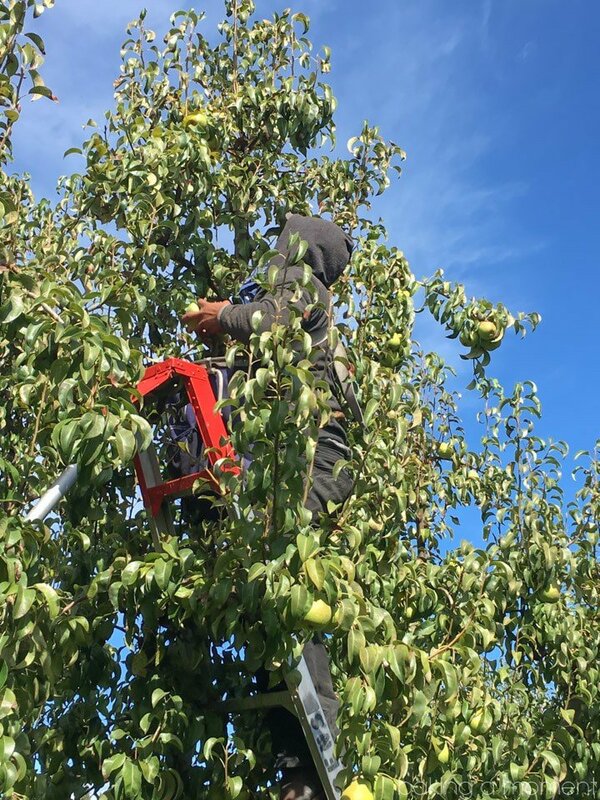 Watching the pickers and listening to the farmers speak, it very quickly became clear how much love and care goes into the production of Stemilt fruit. Later that evening, we visited the home of Tate Mathison. Tate is part of the fifth generation of the family farmers that started Stemilt. He and his wife were so gracious and welcoming, it truly felt like an honor to be there. And speaking with Tate, I really got a sense for how passionate he and his family are about the fruit they grow. His excitement and love for it was positively contagious! Next day, we hit the apple orchards. Something that seems so simple, like planting trees and harvesting their fruit, really has so much thought, care, and science behind it. It was amazing to me. Stemilt has so carefully researched, tested, and perfected every step of the process. You can read lots more about it here. 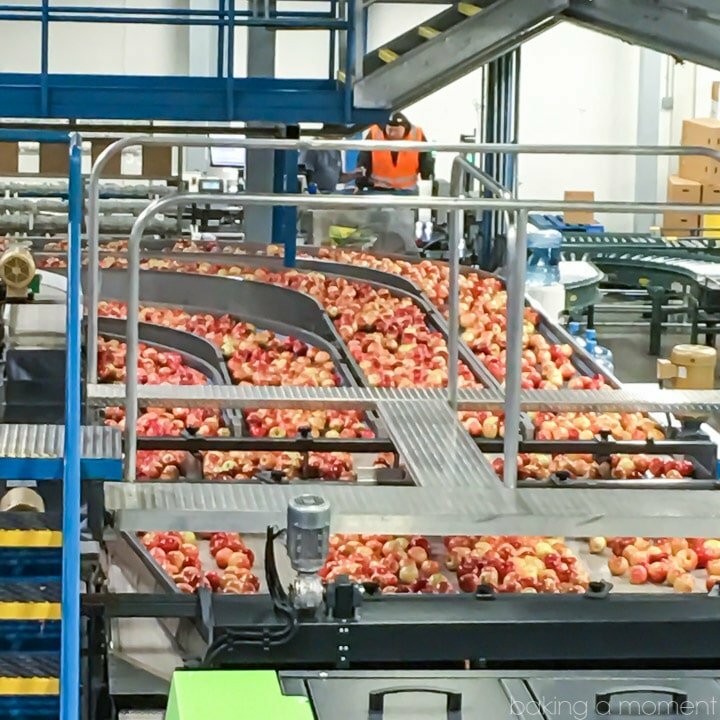 When we visited the packing plant, we really had the opportunity to see that science and technology in action. The facility was so clean, and it ran like a well-oiled machine. Really interesting stuff! So next time you pick up a Stemilt apple at your local market, know that a ton of thought, work, and science have gone into making that the best apple you could ever take a bite out of! Or saute in butter, sugar, and cinnamon and layer into your caramel apple cream puffs. I used Golden Delicious apples for this dessert, which was straying from my usual favorite: Granny Smith. I still love Granny Smiths because they’re sturdy and they don’t turn to mush when cooked. But when I was in Washington I spoke to Roger Pepperl, Stemilt’s director of marketing, and he recommended trying Golden Delicious. So I went for it! And really liked it! If you prefer a sweeter, mellower, less tart flavor in your apple desserts, I think you’d really like it too! Now for a few words about the caramel apple cream puffs themselves. Back in my days as a pastry chef, I literally made hundreds of cream puffs every week. I have had a ton of practice with this thing called pate a choux, which seems to strike fear into the hearts of so many cooks. Please, please, do not be afraid. It may have a fancy French name, but you gotta show that choux who’s boss. And by that I mean, really, really cook it! Every time I hear about someone who had trouble with pate a choux, I can immediately pinpoint the problem, and it’s always, always, they didn’t bake it long enough. Making the batter is easy, you can’t really mess that up. I mean it’s just a handful of simple ingredients. But the baking is everything. Here’s the thing: much like puff pastry, choux produces a lot of steam when it goes into the hot oven, and that steam is what causes the puffs to puff! If they don’t hang out in the oven long enough to really get crusty and firm, then that steam will dissipate as they cool and the structure will just collapse. My advice? When they are dry, hollow, light, and brown all over? And you think they’re definitely done? Give them another 5 minutes. For more info on pate a choux, be sure to check out this post, where I give step-by-step instructions on how it’s made, with pictures! And that fluffy cream filling? Omg it’s to-die-for. It all starts with that staple of every pastry kitchen: pastry cream. It’s like vanilla pudding but way better. I have a step-by-step tutorial on that one too, with video! Check it out here. 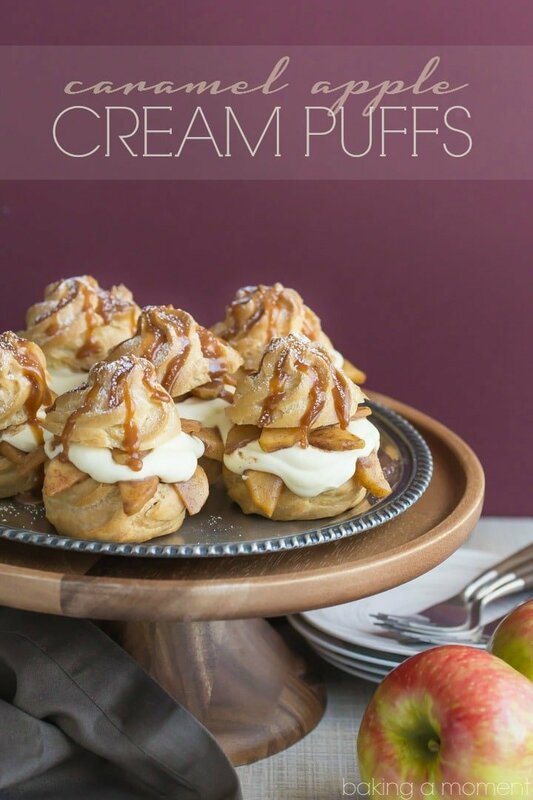 Once it’s cooled, you fold in whipped cream, and the contrast between crusty puff, juicy caramel apple, and fluffy cream is a bite of pure heaven! I really hope you’ll give this gorgeous dessert a try; it’s such a great way to celebrate apple season! Preheat the oven to 425 degrees F, and line 2 baking sheets with parchment. Place the water, butter, sugar, and salt in a large saucepan. Cook over medium-high heat, until the butter is completely melted and the mixture is simmering. Add in the flour all at once and continue to cook, stirring, for about 5 minutes, or until the dough gathers into a ball and a film begins to form on the bottom of the pot. Drop in the eggs, one at a time. Allow each egg to become fully incorporated before adding the next (about 30 seconds to a minute). Bake for 25-35 minutes, or until very dry looking, puffed, and deep golden brown. Pour the pastry cream through a fine mesh strainer, into a heat-safe bowl. Use the back of a ladle to press the mixture through the sieve. Whip the cream until it holds stiff peaks. Fold the cooled pastry cream into the whipped cream. Add the apples, sugar, cinnamon, and salt. Cook, stirring occasionally, until the apples have softened slightly (about 5 to 10 minutes). Slice the pate a choux puffs in half horizontally and layer the bottom half with 5 to 8 slices of cooked apples and about 1/4 cup of cream filling. Sandwich with the top half of the puff and drizzle with Simply Perfect Salted Caramel Sauce. To make ahead: Make the choux puffs, pastry cream filling, and toppings two to three days ahead. Keep the choux, pastry cream, and sauteed apples refrigerated. (Caramel sauce can be kept at room temp.) Fold the whipped cream into the pastry cream, and assemble the caramel apple cream puffs just before serving. PS- If you love recipes made with fresh, seasonal fruit, be sure to check out The Stem Blog, where Stemilt showcases tons of great info and recipe ideas! what a fantastic trip and opportunity for a behind the scenes peak at where the best fruit comes from. These cream puffs are perfect for fall. and you’re right! it’s been way, way too long since I’ve made (or eaten) a cream puff. time to remedy that now! Thank you so much Cathy! I felt so grateful to be on that trip, it was the experience of a lifetime. Thank you so much for the sweet comment! Cream puffs are seriously my all time favorite! And you’re so right about keeping them in the oven another 5 minutes, it truly does make that much of a difference! Can’t wait to make these!